Common iguana and gecko species can make ideal pets for someone who is interested in reptiles and has time to dedicate to the housing, feeding and other care required by these diverse species. On a whole, green iguanas require more space, but some geckos can require more time. Deciding on which species to choose depends on how much time, money and space you're willing to sacrifice. The most commonly kept lizard species is the green iguana, native to Central and South America. Often sold when small and young, these massive lizards can reach 7 feet long, oftentimes surprising their inexperienced owners. 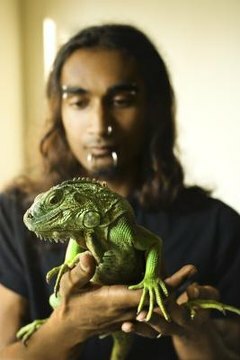 Although not always the case, green iguanas are easier to keep than other iguanas kept in the pet trade. The spiny-tailed iguana, another species sometimes kept, reaches on average 3 feet. Desert iguanas reach about 1 1/2 feet long, while Grand Cayman blue iguanas reach 4 1/2 feet long. Pet gecko species rarely exceed 12 inches long. Frog-eyed geckos come in at about 5 inches long, while the giant day geckos reach around 12 inches. Most geckos remain fairly small, requiring only a 10 to 20 gallon tank throughout their lives. Arboreal geckos need more height, while desert species require more ground space. Green iguanas, on the other hand, will require a tank that is approximately 12 feet long by 6 feet tall by 6 feet wide. Adult green iguanas quickly can reach anywhere from 4 to 7 feet long from nose to tail; their housing must be at least twice as long as their body length. Height is equally important in creating a suitable green iguana environment, as these guys spend a lot of time in trees in the wild. Green iguanas primarily are herbivores, although on rare occasion they'll snack on carrion or another protein source. In captivity, this is one of the greatest mistakes new owners make. Green iguanas need green, leafy veggies supplemented with nutritionally complete commercial diets. Allow your green iguana fruit a couple of times a week, but limit his sugary intake. Some other pet iguana species are omnivorous, such as the spiny-tailed iguana, which primarily feeds on insects during its youth and more vegetative matter during adulthood. Geckos, on the other hand, primarily are omnivorous and need a diet consisting of live crickets or commercially sold worms. Some even may enjoy fruit on occasion. Green iguanas need to climb to feel comfortable and at home. Although they're a rather large species, they are prey to many animals in nature and hide among the canopies of trees. Spiny-tailed iguanas, on the other hand, primarily are ground-dwellers as adults, and will require substrate soft and deep enough to dig burrows in. Gecko habitats will vary by species. Tropical species will prefer a taller habitat with branches and hiding places, while desert geckos will need a more arid environment with a sandy bottom. Anole Lizard: How Long Until the Egg Hatches?